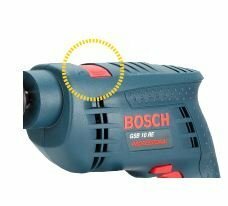 A two-in-one drill and screwdriver set, the Bosch GSB 10 RE kit is perfect for both beginners as well as professionals. 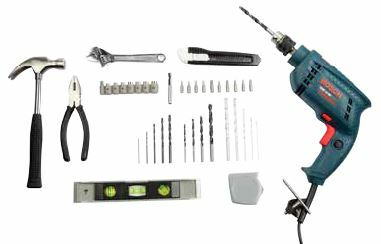 Whatever the job, this drill will become your best friend with its many accessories that ensure that you never need to call the repairman anymore. The most compact in its range, with an ergonomic design that is easy for beginners and experts alike, it comes in a tool kit that accommodates 100 accessories covering everything you will need while working. At 500 W, this drill provides the exact amount of power and support you need in completing tasks around the house. 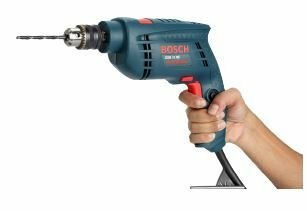 Often the size and weight of drills weighs one down, but not with the Bosch GSB 10 RE. It has been built in a way that optimises working in difficult situations such as small spaces or overhead tasks, making it less tiring for you and getting the job done perfectly. 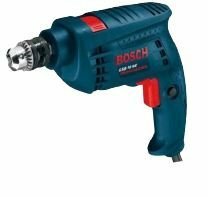 At just 1.5 kg, this drill provides a stress-free experience as it is so light to carry, making it the perfect choice in terms of portability and carrying around. Weighing a total of 4.5 kg, this portable tool kit ensures convenience and functionality. Along with the 1.5 kg drill, you also get 100 accessories, all of which are housed neatly in this easy to maintain, well-designed kit made of superior and long-lasting material. This accessory allows you to both hammer nails into wooden surfaces, as well as lever it out using the curved claw to pry it out. Bits for all rotary related work while screwing and unscrewing nails and plugs into any surface. This is a spanner with a jaw that is compatible with different nuts and bolts. The device used to reveal if the surface is perfectly levelled. A multipurpose utility knife that helps you in any cutting related work while working on a wide range of projects. These are appropriate while working on metal surfaces. These are appropriate while working on concrete surfaces. These are appropriate while working on wooden surfaces. A tool used for tightening and loosening nuts. A multi-use plier that allows you to work on wires by bending, twisting and cutting cables. Multiple screws and plugs of different usages and sizes which act as the main components in drilling. Makes changing screwdriver bits easy with its magnetic tip that fits all standard bit sizes, making it easy to ensure the bit doesn’t fall in hard to reach areas. Insert and remove drill bits with ease while working on different surfaces with the key chuck that comes attached to the bottom of your drill. A measuring tape is a device which provides accurate measurements when working on home projects in a very simple and easy way. This 100 piece tool kit comes packed with a host of essential accessories including 1 keyed chuck, 1 plastic carry case, 5 masonry drill bits (4, 5, 6, 8, 10 mm), 5 metal drill bits (2, 3, 4, 5, 6 mm), 4 wood drill bits (4, 5, 6, 8 mm), 1 claw hammer with rubber grip, 10 screwdriver bits (ph1, ph2, pz1, pz2, s4, s6, h4, h5, t20, t25), 1 screwdriver magnetic adaptor, 7 sockets (4, 5, 6, 7, 8, 9, 10 mm), 1 nut driver adaptor (1/4″), 1 measuring tape (3 m), 1 combination plier (6″), 1 adjustable wrench (6″), 1 adjustable knife (1″), screws (3 mm – 10 pieces , 4 mm – 10 pieces, 5 mm – 10 pieces), S-Plugs (4 mm – 10 pieces, 6 mm – 10 pieces, 8 mm – 10 pieces) and 1 3-directional sprit level. The forward/reverse mode in the GSB 10 RE allows for easy and quick shifting between clockwise and anticlockwise directions based on the job you are working on. This switch can be found at the bottom centre of the drill. Easily manage the size of the pilot hole you are drilling using the efficient electronic control technology which helps you guide the drill with precision and exactness. 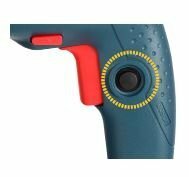 The forward function helps you insert and remove nails, screws and bolts through its ability to shift modes with the click of a button. With the rotating brush plate, you can move back and forth between forward and reverse modes while screwdriving, facilitating an easy rotary action. The impact drill comes with a very convenient switch which locks the speed you are working on to ensure a consistent drilling experience, especially for beginners. 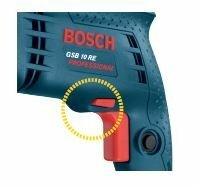 This small black switch positioned on the left surface of the impact drill, just needs to be clicked once in order to lock the speed of drilling, a feature that is very helpful when you desire a constant speed while working on projects. Designed to sit comfortably in your hand, the GSB 10 RE gives you the freedom to work conveniently and stress-free anytime, anywhere.